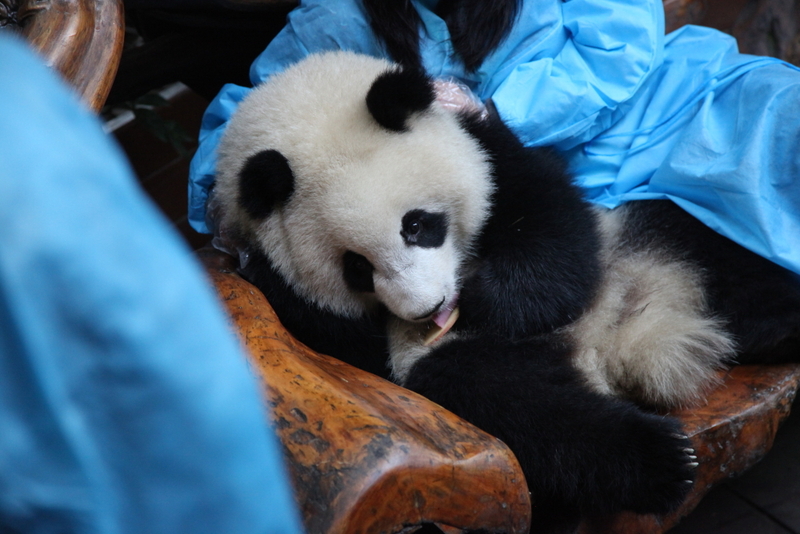 We arrived at the base and our guide quickly secured our spot for the panda cuddle. 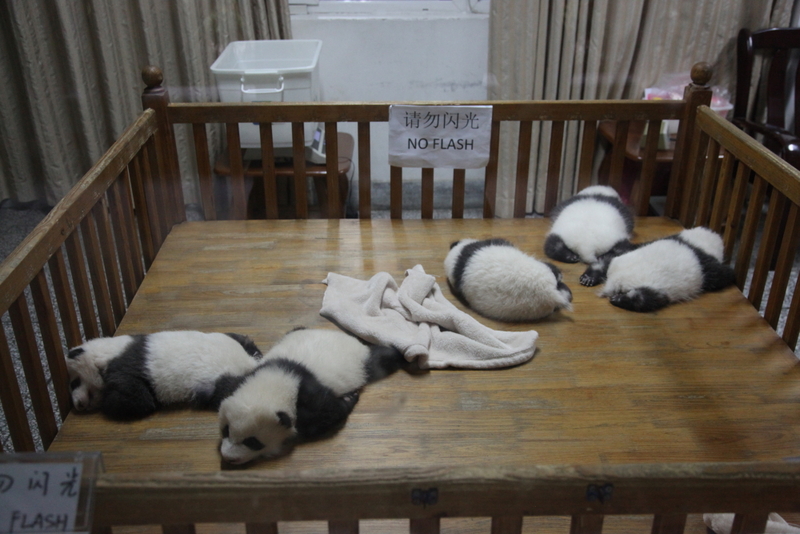 With time to spare we saw our first pandas in China – 5 baby pandas in a cot! We couldn’t believe how cute and fluffy they were. We could have spent the whole day watching these sweet little cubs sleep but there were more pandas to see and we wanted to see them! We walked along beautiful paths surrounded by bamboo to the next group of pandas – a mother and cubs. 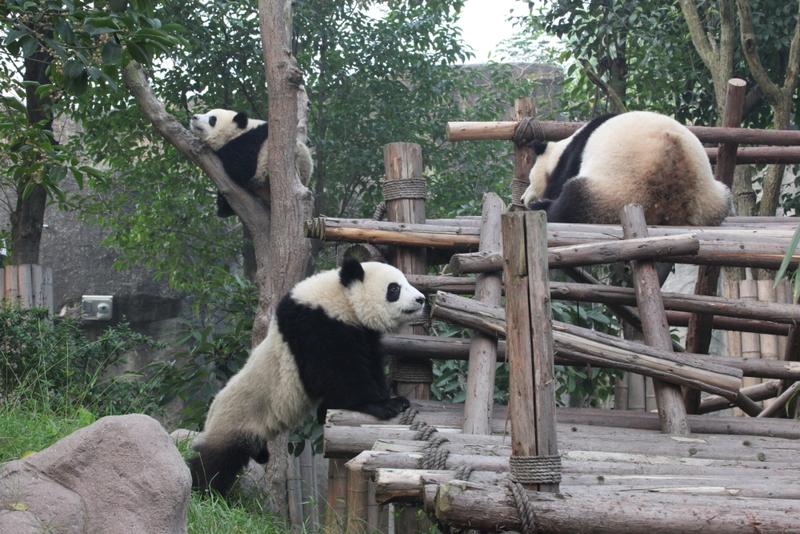 The playful pandas entertained and delighted their spellbound audience. They ran around, dropped from trees and structures and one young panda even suckled on the mother while she reclined on her back. It was breathtaking to see them in these beautiful enclosures surrounded by their natural habitat. We got to see quite a lot of the park but the time had come to meet the little panda!! We were taken into a room and shown an informative video about pandas. Then we were taken to the hugging room 🙂 We were given a protective coat, booties and gloves to wear and waited in a line before an exquisitely carved bench. Next to the bench was a tray with a jar of honey, slices of apple and bamboo. A keeper arrived carrying the young Miao Miao and settled her on the bench with some of her treats. She had a good look at her adoring fans, then proceeded to lick a honeyed apple slice. When she was finished she turned to the keepers and stared at the table. They ran to assist her, offering a sweetened bamboo stick. She graciously accepted it and happily munched on it while she prepared to be greeted by her spellbound audience. One by one we took our turn to sit by the little princess. When my turn came I was overwhelmed with emotion. I sat next to the little panda and cuddled her. She looked up at me and munched away at her bamboo. So many thoughts were going through my head – how lucky I am to be sitting next to her, how cute and adorable she is, how soft yet wiry her fur is, how pinchable her ears are, can I take her home with me? – were some of my jumbled thoughts. Mostly I thought about how endangered pandas are and how important it is to protect them and do all we can for them. I was also surprised at how much time we had with her. I was expecting to sit down and then jump up a few seconds later but they let us sit for a good while – of course I would have liked longer, like maybe a few years! It was Paul’s turn and they let him sit next to me for a few photos as a couple so I got extra Miao Miao time 🙂 I reluctantly left Miao Miao and the bench so Paul could cuddle the precious little cub. We said farewell to Miao Miao and went back to exploring the reserve. 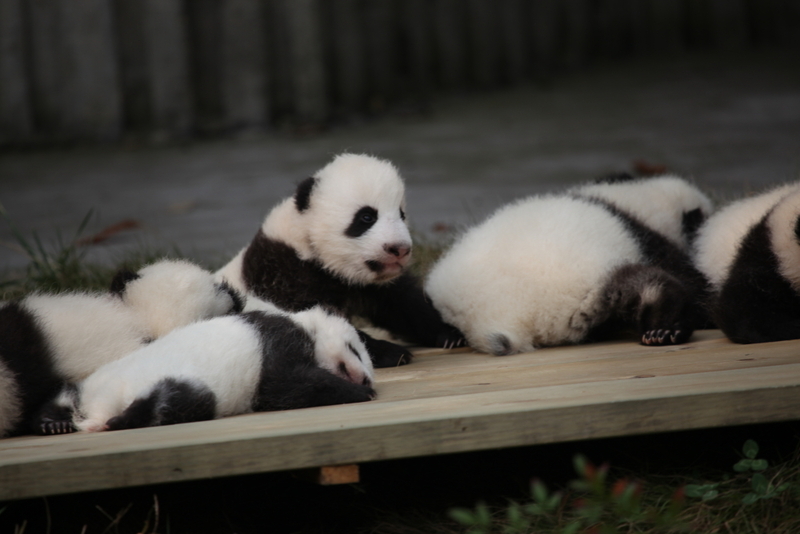 One of the next things we saw was a group of tiny baby pandas sun-baking on a plank of wood. We couldn’t believe what we were seeing – our brains nearly stopped working! As we watched these sleeping cuties one panda woke up and bravely wandered off the plank. When it wandered off too far it stopped and started squeaking. It was too much cuteness for me. 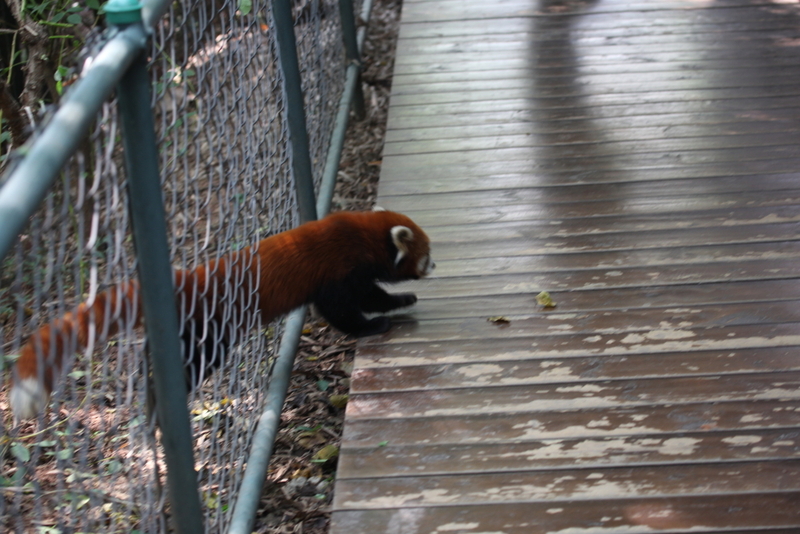 I wanted to jump into the enclosure, take the squealing cub, and smuggle it home with me and Miao Miao. But before I could jump in an attendant came and rescued the cub, placing it back on the plank. A few minutes later he returned with a bucket and scooped up a couple of cubbies and left. We were told some VIPS were going to have their photos taken with them. 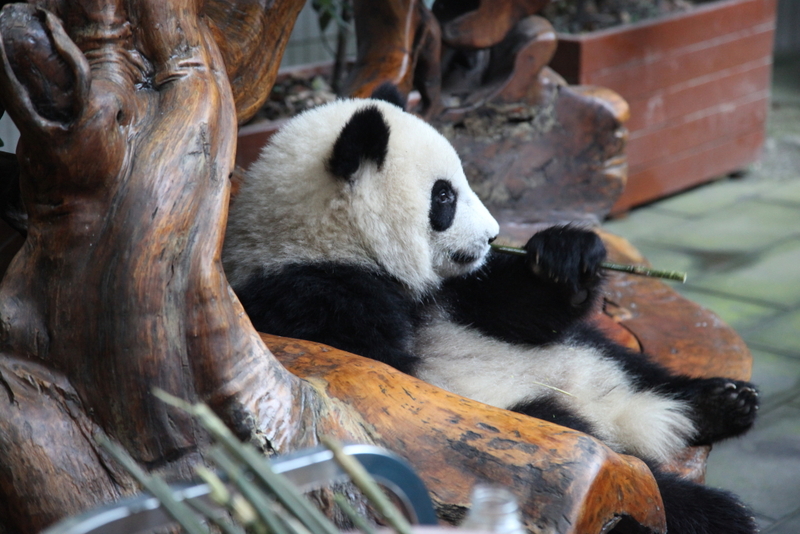 Not long later the bucket returned and the celebrity pandas were scooped out and promptly went back to sun-baking. 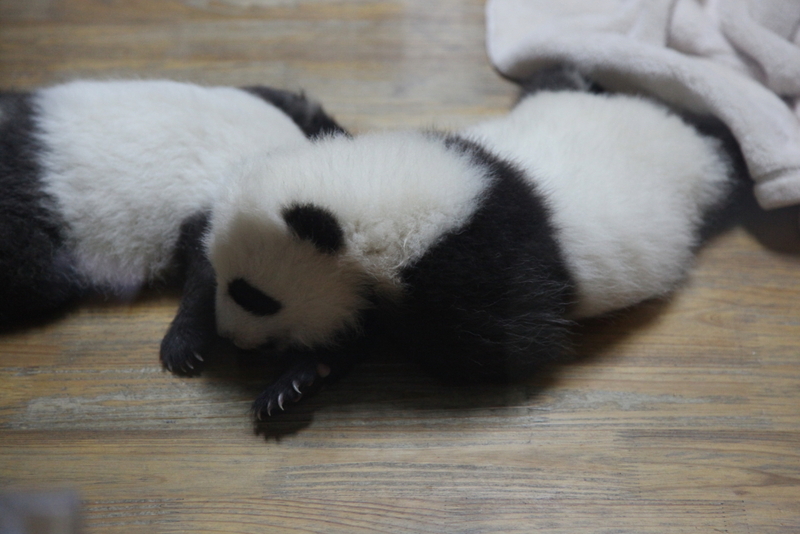 Later in the day we were lucky enough to see these baby pandas asleep in their cot in the nursery. 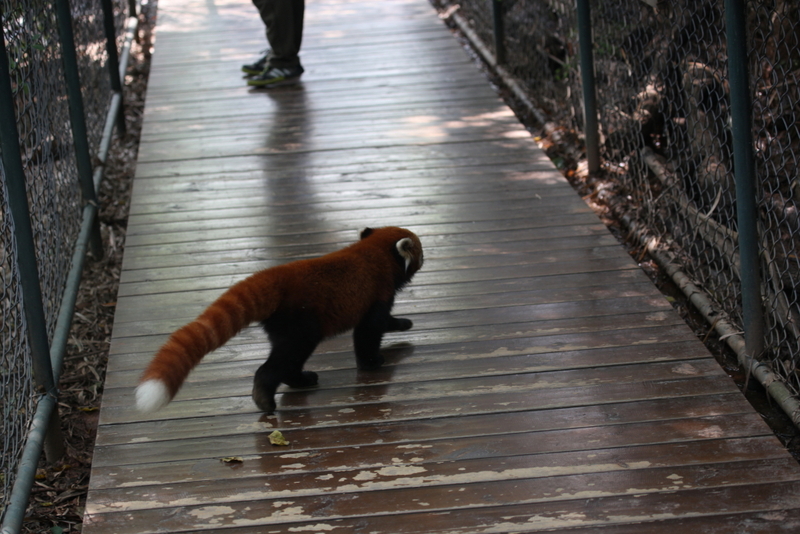 We ended our day with red pandas. They were in a part of the reserve where they could wander around freely. 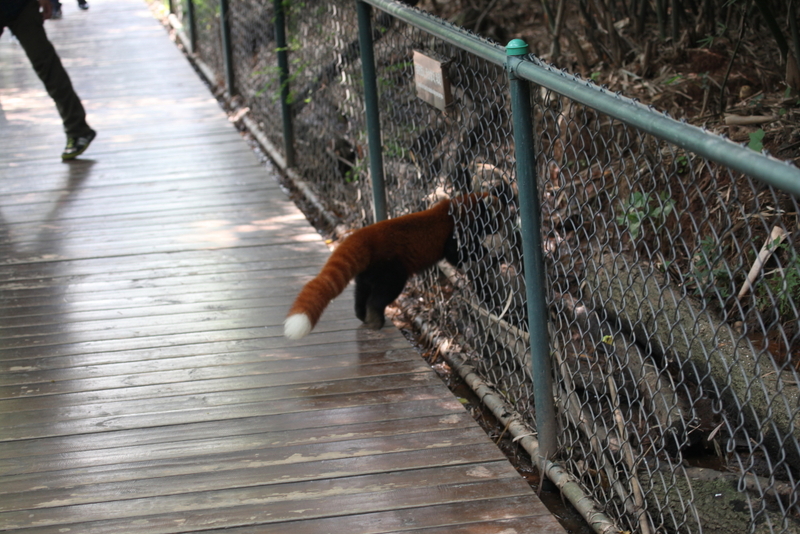 The fence along the walkway had holes for the red pandas to wander through. I stood, stunned as I watched a red panda climb down a tree, go through a gap in the fence, walk past me, go through a gap on the other side, and then sit next to a bowl with food. It was surreal and heaps of fun! 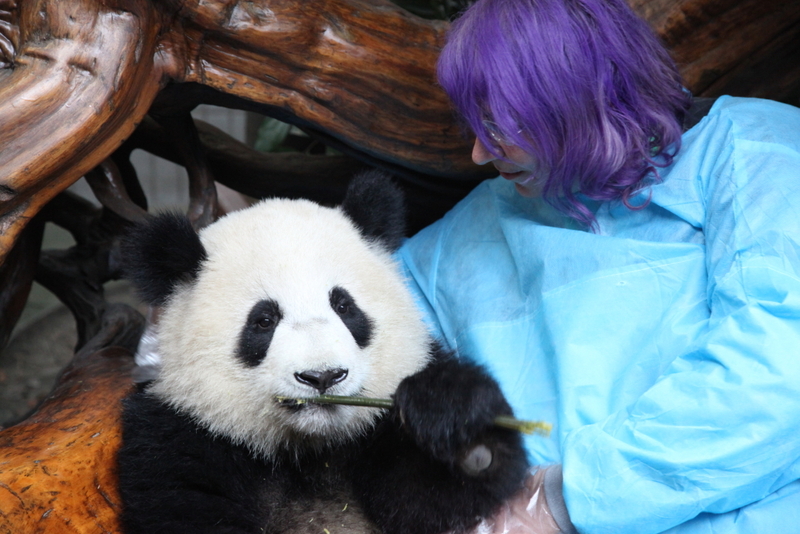 Chengdu Panda Reserve surpassed my expectations. It was incredible and I’m glad we chose to spend a whole day there. 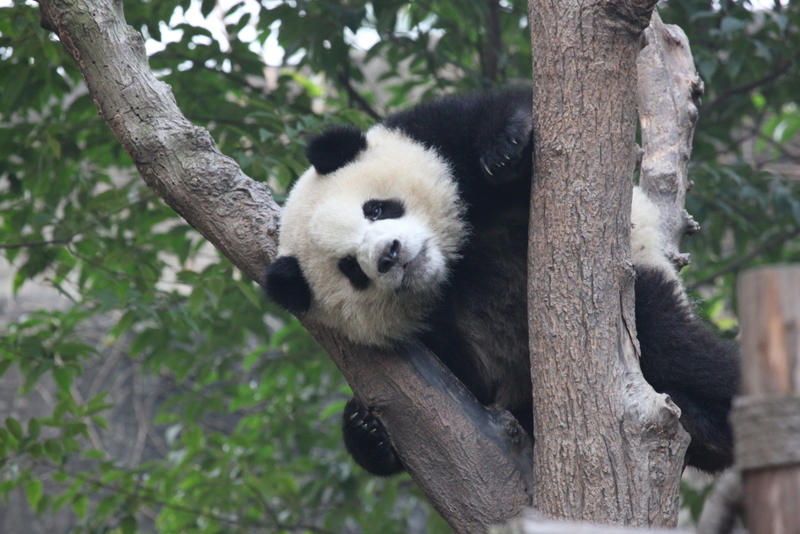 I couldn’t wait for tomorrow and our trip to Bifengxia Panda Reserve. The author’s manner of writing made me feel as if I was there. Vicky, as I read this, I felt as if I was sitting with you and Paul, experiencing this so-great-it-is-impossible-to-imagine opportunity. Thank you for your marvelous recounting of this remarkable time in your life. My home zoo in Seattle, the Woodlawn Park Zoo has always had red pandas, so I am especially partial to them as well. Thank you so much CG. I am so glad you enjoyed it. We’ve had red pandas at Melbourne Zoo for a long time and they were always a favourite of mine. I want a baby panda they just look so cute, looking after those adorable babies has to be one of the best jobs out. 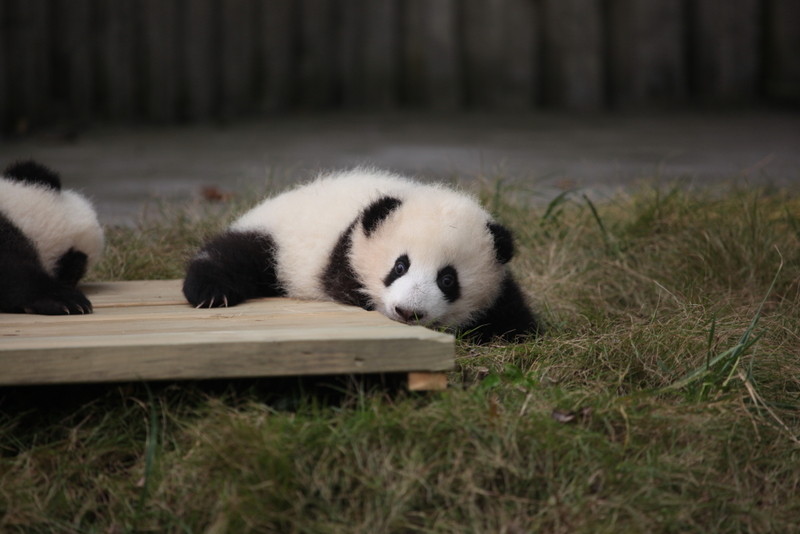 Stand in line – we all want baby pandas!! 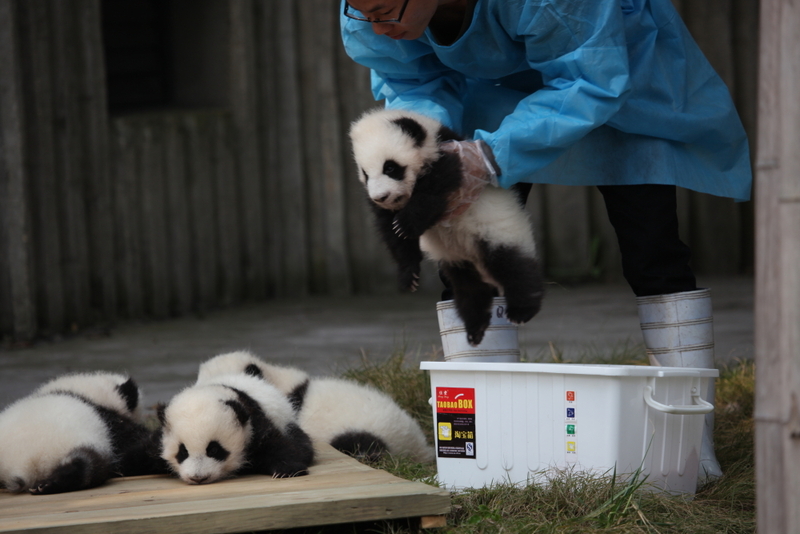 As for the job of being a baby panda keeper – how much fun would that be!